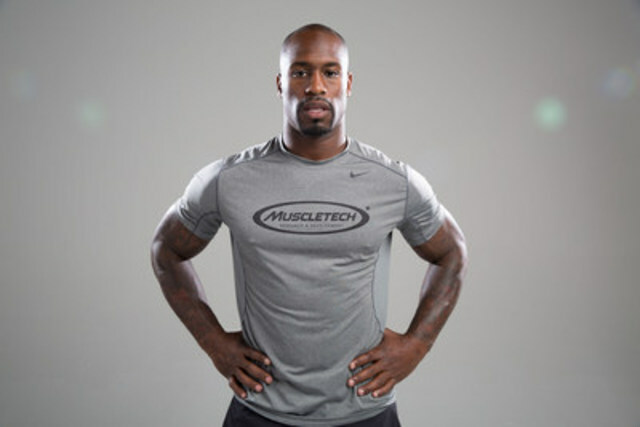 OAKVILLE, ON, Feb. 8, 2016 /CNW/ – MuscleTech® – the leading sports nutrition supplement brand in America, is proud to announce the signing of the Denver Broncos® all-pro Tight End and two-time Super Bowl player Vernon Davis, to represent the MuscleTech® family of products. As an accomplished athlete with relentless drive to be the best in professional sports and in fitness, Vernon was a natural fit for MuscleTech. “Vernon embodies the champion-caliber athlete who constantly strives for excellence and trusts MuscleTech products to support athletic performance,” says Iovate Health Sciences International Chief Marketing Officer, Brian Cavanaugh. MuscleTech believes in helping to create the best athletes everywhere – from the pro level competitor to the regular fitness enthusiast who wants the best performance and results. Vernon will be featured in an integrated marketing campaign that combines print, digital, in-store point-of-purchase materials, and multiple social media platforms that engage fitness-minded fans everywhere. MuscleTech products are available nationwide at GNC®, WalMart®, The Vitamin Shoppe®, Bodybuilding.com™, Amazon.com, and other fine retailers. For more information on new MuscleTech products, click here. Also follow us at Facebook.com/MuscleTech and @Muscletech on Twitter® and Instagram® for product and athlete information, news and updates, diet and training tips, special promotions and more.